STRUMIS LTD is delighted to announce another investment in STRUMIS’ solutions by leading international steel companies in the EPC, Fabrication and Construction sectors. Regional Manager (Sales) for STRUMIS LTD, Simon Slater, commented, "We are extremely proud that the Canam Group team has elected to implement STRUMIS across their sites; this is a significant addition to our prestigious global clientele and we are pleased to continue our outstanding working relations with them." In 2011, Canam Group completed 9,240 construction projects, and operates 20 manufacturing plants, covering an area of 3,112,535 square feet (289,160 m2), with an annual production capacity of 764,000 tons. 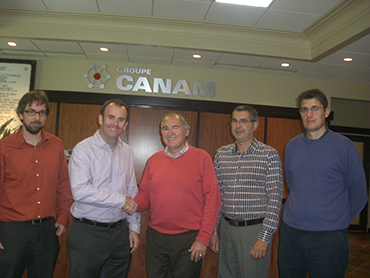 Canam Group has engineering offices in Canada, the United States, Romania, India and China, and has created alliances in China and France. By sustaining its leadership role in the digital revolution and construction of energy efficient buildings, Canam Group provides long-lasting products and solutions that endorse development efficiency and productivity.